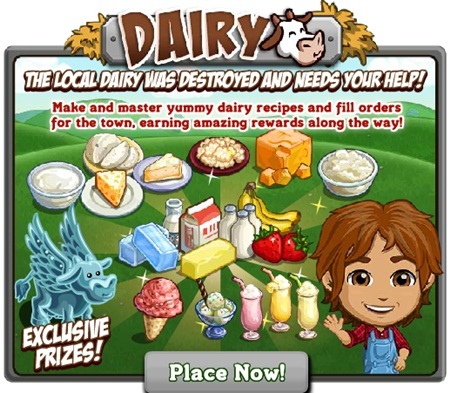 Craft your way to save the town’s local dairy which was destroyed and they need your help to fulfill outstanding orders. 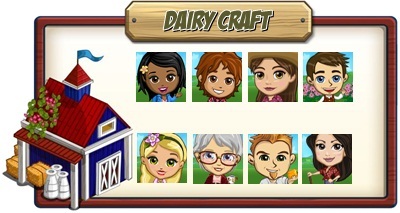 The FarmVille Dairy Craft will be on a slow roll out so some players may not have this feature yet. This feature will also offers exclusive prizes but in order to win this prizes you must complete some or all orders. To start, because this is on a slow roll out there’s a chance when you enter the game a pop up message will appear and tell you about this new feature. You will then have the chance to place the new FarmVille Dairy. No need to worry for parts because this is already build. Order Board: Here you will see the current order from the local towns people. Just click on the picture to see that characters order. To fulfill it’s order just craft the order in the Dairy and you will earn prizes like coins everytime an order is completed. 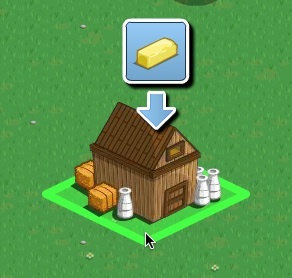 Raw materials: As you level up in the Dairy Craft you’ll be unlocking more raw materials to be used in your crafting. There are a total of 5. The first station will be the Milk Station. Then as players level progresses and so the recipe’s and list of ingredients will expand. Crafting Machines: players will be starting with the Butter Churn Machine then will unlock several more as their level progresses. As of now there are a total of 6 Crafting Machine and they are: Butter Churn, Creamer, Cheese Ager, Milk Shake Machine, Flavor Station, and Freezer. Creamer: creates Cream, Yogurt, Cottage Cheese, and Kefir. Both are already attached to the Dairy. These two will hold your raw materials and ingredients and can be upgraded to increase it’s capacity. Once a player completes an order a corresponding reward is given. You can see what reward an order will give in the bottom left-hand corner of the window. I’ve had the dairy barn for a few days and have been playing it. I’ve leveled up several times. Kind of fun in a simplistic non-time consuming way. What I haven’t figure out yet is how/where do we get the materials to upgrade? Only 10 in each of the silo and barn fills up fast. I know one time when I leveled up was I awarded some Ice Cream Scoopers, but I don’t know how to get the other materials, unless it’s with Farm Cash. I haven’t seen them in the regular crafting barn, but maybe they’re roll out later on. how do we place orders with our neighbours?? Anyone figure out how to expand yet? Kind of frustrating to complete recipes when you need milk and cultures and can only hold 10 total. I want to know how to get the parts for expanding the silo in dairy. expansions come with completed orders/level ups. outside of that it’s all fv cash unfortunately. currently there’s no indication of ordering from neighbors or making any other kind of request. players need to complete orders to earn parts for the expansion. Has anyone received milk bottles as a reward for leveling, in order to expand? My dairy is level 9 and I’ve yet to get them, but I have more than twice the necessary number of other parts. I’m at Level 13, and the only leveling goods I’ve gotten are the 12 scoops. My barn now has a capacity of 20, but that just seemed to happen randomly. Still stuck at 10 for raw goods. I just leveled up to 12 and my Silo still only holds 10- I have 24/10 of the first item, Ice Blocks, to expand and 0 of the other two items. Somehow my barn upgraded to hold 20 items, i did not notice when it did it. I have more of the scoopers than I do of the other 2 items. No milk bottles or ice blocks for completed sets of orders and I am at level 26. They apparently insist on getting farm cash for those. Got unneeded extra ice cream scoopers rather than dairy shelf or cheese cloth. So, barn is stuck at 30 inventory and silo at 10. It is enough but you have to put some planning into it. Level 42, and I still haven’t got any milk bottles to expand the silo, still at 10 capacity. The only thing that I keep in the silo is milk. Everything else, like flavours, can be produced so quickly that I wait until I need them. Although I like the rewards on the Dairy barn when you finish all the recipes,it takes to long to make some of them. I am on level 16 and have to make 3 recipes that take 16 hrs for each one,not counting all the ones that take 12 hrs to make! It would be nice if there was an upgrade so that more then one of the same type of recipe can be made at a time. I have to complete 10 orders this time,this one is taking a long time. I’m in the same place as you, but at least there aren’t any time requirements. I think it’s the strategizing that makes it fun. If we all stick together and none of us pay to upgrade- hopefully they will relent. (don’t worry- i won’t hold my breath! Dairy- Level 28 and still NO Bottles to Upgrade! I have bottles but no ice blocks any further news yet for where these items come from? I’m at level 8 and I have already gotten the bottles and scoops, and the current board will give me 12 of the ice blocks so I don’t know if it is just a totally random way of getting them, but from what it sounds this is going to get frustrating fast (well, as fast as it can having to make 5 to 6 “12 hour” items). Tim, I am on level 19 and have been able to upgrade one time and my silo and barn good part, so I think it is totally random also. Your right, it does sometimes get frustrating,just wait until you have to start making all them recipes out of the Flavor station that take 16 hrs for each item (about 4 to 5) and two of each of the 1 hr to 6 hr item from the creamer. Sorry I meant to write, I have been able to upgrade one time on my silo and one time on the barn goods. I’m on level 34 and still no bottles. It would at least be nice to know when/if the bottles ever show up. I’m on level 37 and my silo is still only holding 10 as I refuse to buy the milk bottles needed to expand. The barn has expanded itself to 30 which was fortunate as I also didn’t have any cheese cloths. Most of the items in the freezer take 24hrs to make. Typical of Zynga damn money hungry. I take it any upgrade is cash only. I am also level 37 and have not gotten ANY silo upgrade pieces! I have two cheese cloths but don’t know how I got them. I am getting annoyed by this. We all need to complain to FarmVille and demand that they give all the items needed to upgrade the Silo and barn instead of giving out Milkshake Trees. Twice today, I have clicked on creamer and it has started making cottage cheese. What’s with this? It’s been fine up to now. I’m on level 19, and STILL….. no bloody Milk Bottles to expand the silo. SMH! The last “prize” was Dairy Shelves(have 26 now). Even though I needed Cheese Cloth to expand the barn. I have 2 orders left to fill for the next prize, which is a friggin Cheesy Sheep. And 3792 DP to reach level 20. I’m on level 65 and still haven’t got any milk bottles. Doesn’t stop me getting on, just requires a bit of forward planning. I am on level 11 and my last few level ups I get milk jug flowers, I have no idea what to do with these things? How many levels are there in the dairy? Diann, I’m thinking there is around 100 levels or more because I’m on level 76 and still have orders to make. I am now on level 413 with no end in sight, and the system still hasn’t given me the milk jugs to upgrade the silo. Almost level 50 and still getting these stupid useless prizes. Give me some pieces to expand my silo and barn please. I am never buying (for cash) anything for a game that has so many problems. If I never see another tree or foal I will be so happy! I’m at level 119 now and it still keeps going up. The good thing is that with every 16 or 24hr recipy the number of dairy points gotten is getting me up a level. And every level up gives me around 95000 XP. So basically the dairy is good for leveling up in Farmville. I have to agree with this comment regarding leveling-up. I can often go up two levels in one hit just by producing a couple of high-value items. I’ve gone up around 20 levels courtesy of the Dairy. me too. how do i expand my silo when the rewards don’t include the ice blocks and milk bottles i need? i am not paying for it. instead of what i need, i’m given TWO sundae trees. yay! I believe it’s 2 yogurts and 2 bananas. If you don’t currently making anything in the flavor station, it’ll show you what you need to make them all. I found that I can click the machine EVEN WHILE it is making something and it will show the recipe list. Have you discovered that as well, by now? I think being able to click on the machine while it’s making something is a new feature. It used to only tell me how long until done. I like that I can click on the machines to see what all is needed to produce something. I’m now at level 106. My barn holds 30, but my silo still only holds 10 (I’m still hoping to get some bottles one day, but I do have 60 thermometers!). It is obvious that it is completely random as to what is available on different levels. I only ever keep milk in the silo so that I can keep up the production of butter and cream. Everything else takes such a short time to produce that I simply get fruit, etc. as and when I need it, either for a recipe or for an order. I also try to keep one or two of each goods produced and stocked in the barn so that when a new batch of orders appears I can often complete half of them within the first few minutes just by gathering/producing the right amount of fruit, etc. It really is just a case of forward planning. For instance, I don’t complete an order that requires just one kefir until I’ve produced two which I can use towards the flavoured variety which, in turn, is needed to produce gelato. Then, while the longer-timed items are being produced I can get the shorter-timed items produced. Hi I have over 30 bottles now but now ice blocks. Wish they would publish a guide on how this works. I really like this little dairy barn, I wish they had more of this type of thing.I don’t have to ask for anything or plant anything in order to make the recipes. What I really like the most is how fast you can increase your levels. I have been working on the Hawaiian Paradise quest and needed to be on level 132 in order to plant one of the crops,by using the dairy barn I was able to go from level 88 to 132 within a few weeks and also made a lot of coins. Does anyone have any idea when the ice cream scoops appear. I am at level 96 and still no ice cream scoops. I have several items required for my orders/recipes like banana and strawberry milkshakes yogurts etc but my game will not use them just says sell ? I cannot complete recipes if items just sit in the barn ANY IDEAS ?? Are you working too far ahead? If the storage gets full you cannot get things in, and you have to sell to make room, even if things are needed for an order. I try NOT to put the fruit and such in there; I only grab those when needed. Then I make the long-term products first. For example: If I need gelato, cheese and bananas for an order, I work on the stuff for the 24hr gelato first, then the cheese, and grab the bananas just before I fill the order. Would that help in your situation? I am stuck with just 2 thermometers and milk bottles! How does one store raw goods if you are to craft? Your silo holds 20? Count yourself lucky, I’m at level 210 and my silo is still at capacity of 10! I do a lot with just planning what to harvest and store. I try to store more completed goods in my barn which has a capacity of 30. Update: Last week or so, when I went in my silo and clicked on Expand, I was surprised to see that I had all the items to expand to 20-item capacity. It’s so strange, but nice to be able to have that many items in my silo. I have received two mastery signs [butter and cream]. These look exactly like the crops signs, BUT they will NOT go into the crop mastery board. I don’t know of any other mastery board that has been provided for these [like the bloom board, for instance]; does anyone else know? Hi. Does thier need to be an update before the upcoming Dairy craft in a couple of weeks? i have completed the last task in my dairy at least 8 times. it will not finish the banana milk shake portion of this task.. i am at a stand still. all other tasks are done. I am at level 311. Where does this end? Does it ever finish/at what level?? I decided to stop at level 518. Don’t believe there IS a finish line. I’m at level 951. No, I don’t think it ends either, but I think I’ll keep on to 999 to see if it rolls over to level 1000.